A large picture taking up the whole of Page 3, fulfilling my lifelong ambition to be Samantha Fox, accompanied by a rather nice article by Kevin Core about me and my obsession. I feel simultaneously slightly proud and slightly embarrassed. I am duty bound to mention the Amazoness website. George from that site left the link to the Merseyrail anagram website mentioned in the article, but sadly, when Kevin the reporter phoned me on my mobile at work, I was too flustered and incoherent to remember exactly where the anagrams came from: I've tracked back through the archives and found the link, but sadly it's not working now - not down to me I hope. Sorry I couldn't plug you directly, George, and also sorry to Sue The Lovely Tubewhore, who despite being mentioned as the inspiration never actually got a plug in the Echo. The article's not dreadful, I suppose; he's tidied up my rambles and made it look like I know what I'm talking about, rather than just reprinting my burbles. Not sure I like being called a "buff". I'd prefer to be referred to as buff (hey, I can dream). It made me laugh that even when a professional photographer is involved, you still end up with an up-the-nostril shot. 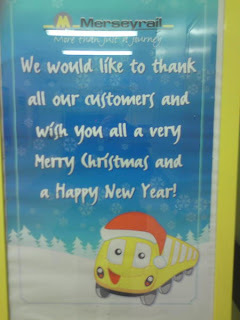 Rudi from Merseyrail was politely bemused in his quote. And I guess this means I can actually cross Liverpool Lime Street off the list as a properly tarted station: the evidence is there for thousands to see! Oh dear. 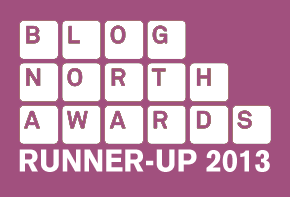 In a world gone mad, tomorrow I am going to have my picture taken for an article in the Liverpool Echo about this very blog* - yes this one, dear reader, the one you hold in your sweaty little hands (if you are using a laptop anyway). **assuming you are reading this in the Liverpool area. Well, it's been a right old posting frenzy this month, hasn't it? I'll try to ignore the fact that for all my random wittering, there's not been too much actual Tarting - ostensibly the reason behind this blog. Somehow it's evolved into me just going on about train stations, and stuff I've seen around. I hope that regular readers will indulge me in this. 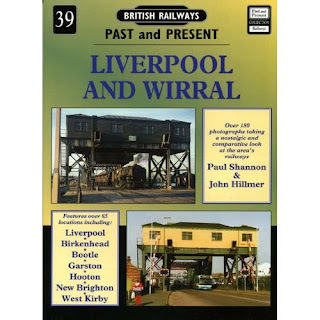 As this project's moved on, I've just become more and more enmeshed in the Merseyworld, and I just get enthused and want to share it. If I didn't put it down here, I'd end up boring The Wife even more than I already do. Either that or my Facebook status updates would become ridiculously long. 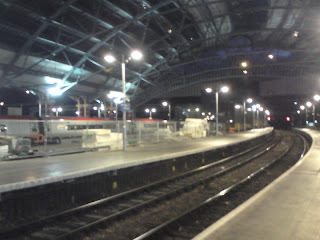 Anyway, to the fulcrum of this post's gist: the continuing works at Lime Street. It's been progressing for a few months now, and I spoke about it back in September. The work area's been fenced off, but plastic windows here and there allow you to have a bit of a nose. I had a poke around before my train to work this morning, trying hard not to look like a super-terrorist. Unfortunately most of my pics didn't come out (I have a new cameraphone, the Sony Ericsson C902, and I'm still getting to grips with it) but a few of them show the extent of what's going on. The main view is pretty impressive. This shot reminds me of a cathedral somehow - I think it must be the combination of the wood and the arches, receding into the distance. These will form the lounges and shops that are being installed along the length of the platform, and they're impressing so far. It's an interesting change from the usual grey steel, or from the mirrored 80s buildings you find elsewhere in the station. Further along the platform, and the ribs are rising above the fence, as though the La Machine spider is making a return appearance. From this angle they actually look malevolent, like legs rising up ready to pounce. 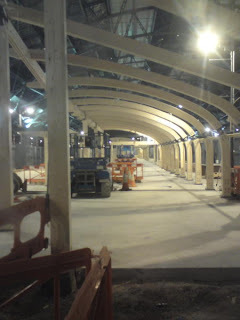 And finally, just to show the extent of the work, the rest of the space between platforms 7 and 8 has been turned into a holding area for the machinery and building materials and what look like enormous pieces of polystyrene. Remember, back in October, I tried to visit Moorfields on the 30th anniversary of MerseyRail, but had my ambitions thwarted by a new toilet block? Well, Robert subsequently commented that the sign was back. So a final Christmas shopping trip gave me the opportunity to have a shufti and see if I could find it. Since the cosmic significance of the 30th birthday trip was now lost, there wasn't much point, but it was nice to find it for completion's sake. If I can sound like an 80s American sitcom for a moment, I gained closure. And there it is: Gawd bless you ma'am, and all that. Well done on your consumate unveiling skills. Please also note that Bache is replaced by Hugo Drax, which seems a bit odd at first, since Hugo Drax is in Moonraker and that was Roger Moore. However, it should be pointed out that in the novel, Sir Hugo Drax is originally from Liverpool, so this is a clever use of 007-Liverpool referencing (even if it's been placed in Cheshire). Strict Bond-geekery however makes me point out that Drax is in fact, not a Scouser at all, but is in fact the Graf Hugo von der Drache, a former Nazi hell bent on dropping a nuclear bomb on London. Even the most militant Liverpudlian hasn't advocated the atomic destruction of the Capital (well, maybe Derek Hatton). From the station we plunged head first into the shopping carnival of Liverpool 1. I love shopping here now; it's amazing what a transformation it's made to the city, not just in terms of the range of shops, but also the shopping experience. There's something so pleasant about the whole city centre now, and the shops are well stocked and beautifully laid out. It certainly beats the hermetically sealed, faux-Classical hell of the Trafford Centre. So I was coming home from work tonight, and Merseyrail was having one of its infrequent ticketing blitzes at Birkenhead Park. Usually this consists of half a dozen ticket inspectors loitering round the bottom of the rank. Half a dozen, because while two do the inspecting, the other four have to do the important job of standing around and discussing what they're having for tea. Tonight was different, though, because there was only one ticket inspector. Accompanying him on the platform, though, were two policemen, who barked, "Tickets ready PLEASE!" like Captain Mainwaring. The commuters were filed past the harassed inspector, his uniform cap parked on the back of his head. He was too busy fending off a man who insisted that his Shotton to Chester ticket entitled him to alight at Birkenhead Park, with ever increasing volume. As I climbed the ramp/steps to the exit, I realised something odd was going on in the ticket hall. My usual exit door was closed shut, and a uniformed policeman stood at the top of the ramp. In fact there were half a dozen of them. The ticket hall was filled with police men and women, all of a garish glow in the dark yellow and anti stab vests, proudly standing around their latest toy: a metal detector. Now, like all good, law abiding citizens, I immediately start looking guilty whenever a policeman appears in my peripheral vision. My guilty look became even more panic stricken when I saw the metal detector, as my pockets were absolutely filled with bits of spare change, while my ManBag contained a bottle opener (always handy in beer emergencies) and a stainless steel tube map (a much cherished birthday gift). In short, when I arrived in the ticket hall, I had a look on my face like a zebra caught on safari, with half a kilo of heroin in his back pocket, and in the middle of shagging the lead hunter's wife. But they let me through. I didn't even have to put my bag through the metal detector. No-one did. Everyone walked past the detector, while the police people smiled and eyeballed and watched us pass. So my question is, what the heck was the point of that? 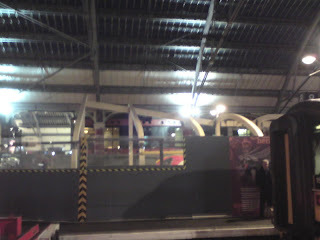 It was a strangely impotent show of force, a point that was rammed home to me once I emerged from the station building. Twenty yards away, outside the 4 in 1 Takeaway over the road, a gang of lads hovered threateningly, dark hoodies pulled up round their ears, a mangy greyhound reaching at the leash. I felt more threatened by them on the other side of the road than I did by six policemen and a metal detector, yet the policemen were locked away on the inside. I wondered what would happen if those lads had crossed the street and accosted me, or the pretty girl in the short skirt who got off the same train: would the policemen have rushed out of the station to our aid? Or would they have remained in patrol round their piece of machinery, letting it do the policing for them? (And yes, I do like Elvis Costello a lot).